Embrace IR35! Still go Limited to enjoy the other benefits. Is being inside IR35 really the end of the road in going Limited? We think not. It’s not unusual for a contractor to fear IR35 or regard it as some form of penalty for doing something wrong. However the consequences of being within the IR35 legislation are very clear and predictable. In fact IR35 is nothing more than a different basis used to calculate tax when certain conditions apply. Unquestionably the tax liabilities under IR35 are higher than those outside IR35; but they are also less than the tax liabilities incurred as an Umbrella employee. What most contractors don’t appreciate is the other non-fiscal (tax) benefits of becoming a Limited company contractor operating within IR35. In this edition of our monthly eBriefs, we discuss why it’s still worth going Limited despite IR35. So what is it that makes you subject to IR35? In simple terms, the way you provide your services and the working conditions with your client determines whether IR35 calculation rules need to be applied. If you perform services in a manner that can be characterised as “similar to an employee” the gross income received is taxed upon you and calculated using the steps set out in the IR35 legislation. These rules are applied to income from individual contracts rather than you as an individual. It’s not right to say you are inside IR35 or outside, you can be both in the same tax year. Your contract is inside IR35 – what next? 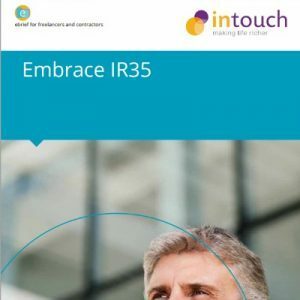 It’s generally more financially and tax efficient to work inside IR35 than go through an Umbrella company, so why not embrace IR35! You can still claim all the expenses you can claim as an Umbrella employee inside IR35 but also more often than not claim additional expenses as an employee of your own company because you are not restricted by the Umbrella’s general expenses policy. IR35 also affords you the additional 5% deduction from income to cover the admin expenses incurred in running a Limited company. You don’t get that with Umbrella companies. This can be enough to enable a small dividend to be paid to you if you wish. Or that extra can be saved within the company to pay out at a later date when you have lower income and therefore less tax to pay. You can consider registering for VAT under the Flat Rate VAT scheme. This allows typical contractors to obtain a significant contribution from HMRC towards the VAT. For a typical contractor, during the first year, this is worth £38 per £1,000 of income, and goes straight into your bank account. Umbrellas often don’t allow you to claim the cost of computers and other equipment or the cost of fitting out your working office at home against your tax, nor can you recover the full VAT on purchases over £2,000! From 6 April 2014 the new Employer Allowance will provide an additional saving of up to £2,000, reducing employer’s National Insurance payable. Umbrella workers do not get any of this benefit. Income not subject to PAYE under IR35 is still available to be taken as a dividend with all the associated tax benefits over salary. What is my take home pay inside IR35? If you are involved in a contract that falls inside of IR35 then a calculation is made each year to determine the deemed salary. Your contractor accountant can do this for you. An IR35 deemed salary is simply a calculation of the Income Tax and National Insurance due. You do not have to actually pay yourself the deemed salary, but you do have to pay the calculated PAYE and National Insurance contributions to HMRC. IR35 deemed salary calculations follow the tax year, being 6th April to 5th April, rather than your company year. If subject to IR35 many contractors are changing their company year end to be in line with the tax year end it’s easier to keep track. Contractors with contracts within IR35 may choose to pay a small salary throughout the year or request their contractor accountant to estimate what their IR35 deemed salary will be and pay a monthly salary in line with that. The benefit of paying a higher salary is that the higher deemed taxes due is spread evenly throughout the year, and you have less shock at the size of the balancing payment each April! So I am financially better off trading through a Limited company rather than through an Umbrella? Absolutely! But also there are still numerous benefits to being Limited if you’re inside IR35. Umbrella service providers can only reward you as an employee, regardless of the status of the contract, so simply being an Umbrella employee means you lose any opportunity to benefit from a contract that may fall outside of IR35. Not all contracts are subject to IR35, even when contractors who initially feel their contract is at risk may be mistaken. As a Limited company contractor you can assess your own position and appropriately manage your risk for each contract. These flexibilities are not available for Umbrella’s employees. As a Limited company contractor you will inevitably be taken more seriously in the business world. You are seen as having a longer term commitment. You are free to build professional credibility and reputation. Many contractors evolve over time and eventually this professional outlook leads to new avenues of opportunity. Have you ever felt that you have to choose an Umbrella proposed by the agency? It’s certainly not uncommon to be told that your agency will only recognise specific Umbrellas. As a Limited company contractor you are free to decide who should help and advise you. You can choose your own accountant and choose how to conduct yourself. Pension contributions are allowable deductions against income under IR35. As a Limited company contractor you can make all your own retirement plans independent to anything the Umbrella may provide. Business insurances and health protection are allowable tax deductions, so you can protect yourself and retain all the benefits of sickness and health cover via cost effective insurance policies. But what about all the business administration? Umbrella providers often talk about the additional administration associated with running your own Limited company, but in reality the practical implications are considerably less than contractors anticipate because the onerous tasks are done by your chosen adviser. We can set up a company for you, manage your accounts and provide ongoing advice in relation to IR35, wages, taxes and expenses, giving you the opportunity to focus on your contract. You get all this for a monthly fee. If you’re inside IR35 we calculate the deemed salary for you too, so it need not be a worry or a reason not to go Limited. Why not explore what becoming a Limited company contractor means for you? Give us a call on 01202 901 385 and we can go through your circumstances and advise on what is best for you.